With Edible British Columbia’s expansion to Edible Canada last summer came the natural move to welcome guest chefs from across Canada to participate in our popular Market Dinner series. We are delighted and honoured to welcome one of Canada’s best known and most popular chefs, Anna Olson, to our Granville Island kitchens on Saturday, May 12. Celebrity chef Anna Olson is best known as host of cooking programs, Sugar, Fresh with Anna Olson and Bake with Anna Olson, which air in Canada on Food Network as well as in 40 countries worldwide. She has authored six bestselling cookbooks, two of which were written with her husband Michael, a well-noted chef and culinary instructor. She is coming to Vancouver to join us for Mother’s Day weekend and share her much-beloved food philosophy with the lucky crowd. 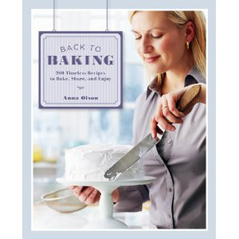 Her common-sense approach of cooking and baking with the seasons as well as respecting the ingredients, the technique and the process of sharing with others through food will charm and delight you. Most of all, cooking should be fun! The evening will be a one-of-a-kind opportunity to meet and chat with Anna, and will make a spectacular Mother’s Day gift for mothers everywhere. Demonstrating some of the Spring & Summer recipes from her book, Fresh with Anna Olson, she has created the following menu for her one night with us. Each course will be paired with special Canadian wines, like Ontario’s Tawse Winery, selected by our sommelier to pair with her dishes. You can book easily online, or by calling our office at 604.558.0040. Gift certificates are available. *Limited seats are available for this special evening.